A New Mac Tip Every Day: Sorting in iTunes! A great tip submitted by Dominic P. Tremblay: Sorting in iTunes! It is easy to choose if you want your music library sorted by Artist or Album, etc, but what if you want to override these settings for a specific album. A problem can arise when a compilation album has music from many different artists. The way to solve this is to assign a different artist name specifically for sorting (such as the album name). That artist name will only be used for sorting and won't be displayed anywhere else. You can assign it in the fourth tab (Sorting) of the "Get Info" (Command - I) window. Thanks for posting my tip. When I discovered that, I was amazed at the power of iTunes. Compilation album were everywhere because they included tracks from different artists! This solved my problem. I love it! Is there a way to make this change to multiple tracks at once? From what I can tell, you can only do it track by track. Also is there a difference between "Sort Artist" and "Sort Album Artist". Thanks. Excellent tip! Many, many thanks! 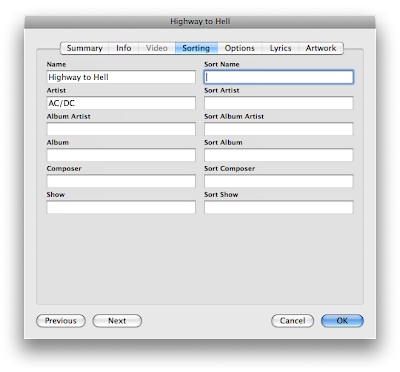 Artist & Album Artist can be used when an albums tracks have featuring guest artists. I use it so I don't get the album artist, plus every featuring artist when scrolling through the artists section on my iPod. I'm confused. How do you do this procedure? For example, I have "The Bodyguard" album which contains several artists. I currently sort my library by artists. How do I make it so I don't see several bodyguard songs throughout my library? Also guys, would it not be easier to just check the "Part of a compilation" checkbox in the Info tab of the Get Info menu? I'm not sure what the problem everyone is having with compilations?! Alll you have to do is select the album, get info, and where it says "Compilation" click the checkbox and then select yes! That will group it as an album! You can even take it a step further and go into your iTunes preferences and tell it to group all your compilations together in your library! Creating a keyboard shortcut in Word! Arrows at the bottom and top! iTunes in the menu bar! Cleaning up your hard drive!